The Bb contrabass clarinet - sometimes called the double bass clarinet - is the lowest pitched clarinet that has gained a somewhat widespread acceptance. There are even lower pitched clarinets, but they seem to exist only in museums or fairy tales.... I'd like to play one of those, however. 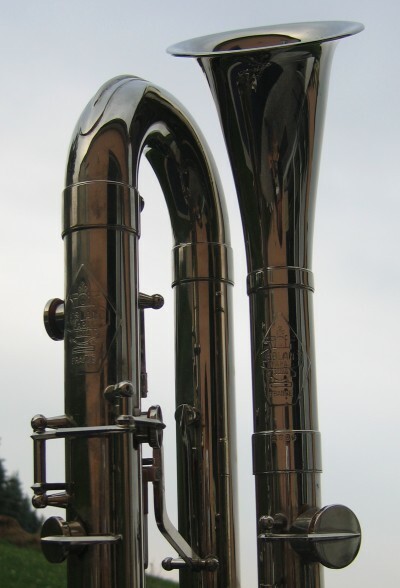 The B-flat contrabass clarinet is mostly used in clarinet choir literature; however, there is more and more wind band literature which makes use of either the Eb or Bb contrabass clarinets. Typically you'd find contrabass clarinet scores in wind band pieces starting at difficulty grade 5. One of the most prominent examples which features a contrabass clarinet, is the piece "Fantasy Variations on a Theme by Paganini" by James Barnes. 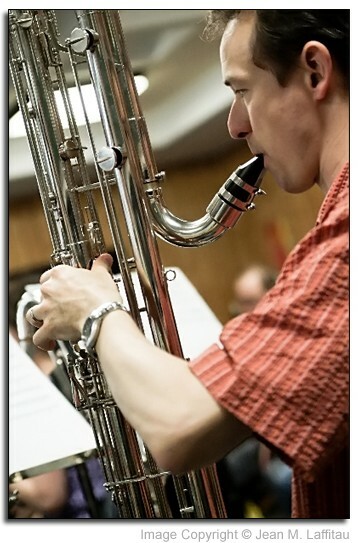 Barnes uses the variation technique to showcase every solo instrument and/or every instrumental section of the modern wind band - which, thankfully, includes the contrabass clarinet. While Barnes originally wrote the solo section for the Eb contra, I played it on the Bb contra. Sounds nicer and allows to avoid an octave jump. Curious? Well, here is a contrabass clarinet MP3 sound clip taken from a live recording from 2005. And just to mention it: the B-flat bass clarinet has also a solo in Barnes' Fantasy Variations, and here the Bb clarinets take over towards the end. Here is a bass clarinet MP3 sample from the same recording, if you are interested. Contra bassoon page and Contra bass clarinet page at www.contrabass.com. Be warned - there are lower pitched clarinets! The most important register on earth: The Bass Clarinets (in german). Slightly high pitched, but still good fun! Should you have any question, feel free to contact me using this form. 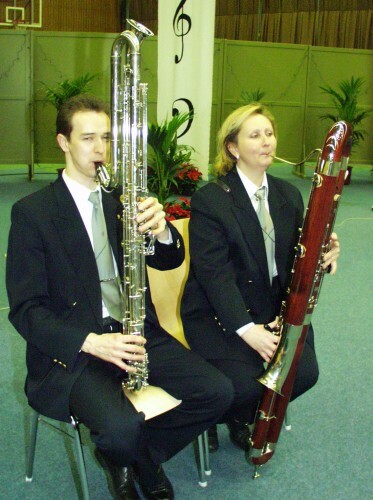 On the two older pictures from 2001, you see me with an equally low-pitched friend playing the contrabassoon. The lower, the better. 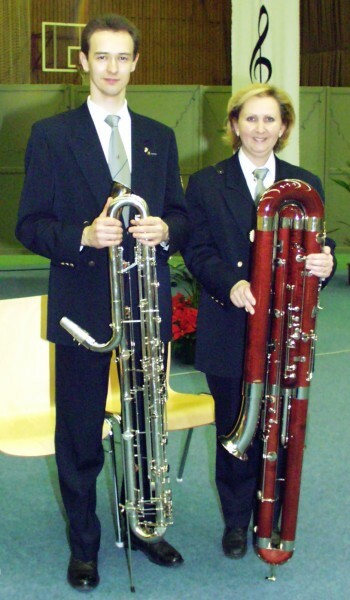 Note that the contrabassoon is roughly twice as long as the clarinet. This is because the clarinet is a cylindrical stopped pipe, which has a resonant frequency half of what an open pipe of the same lenght would have.